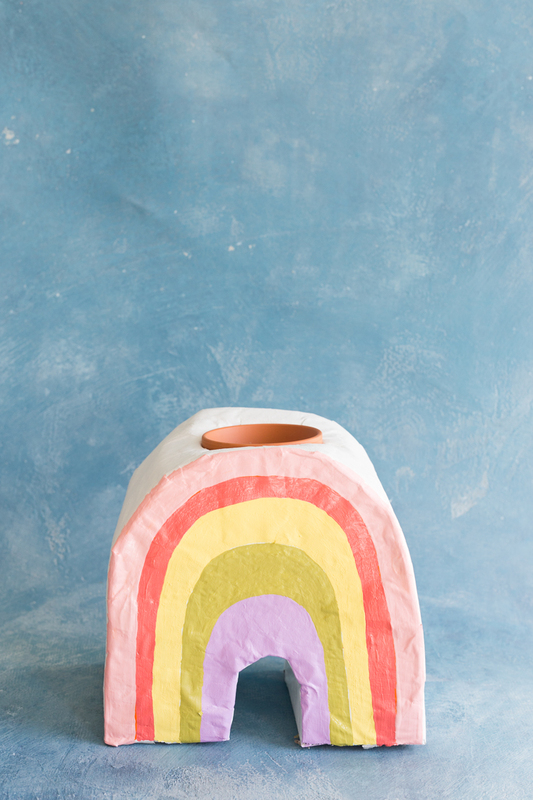 We’re big fans of ceramics artist, Lisa Junius, and came across her rainbow vase, which was no longer available for purchase. 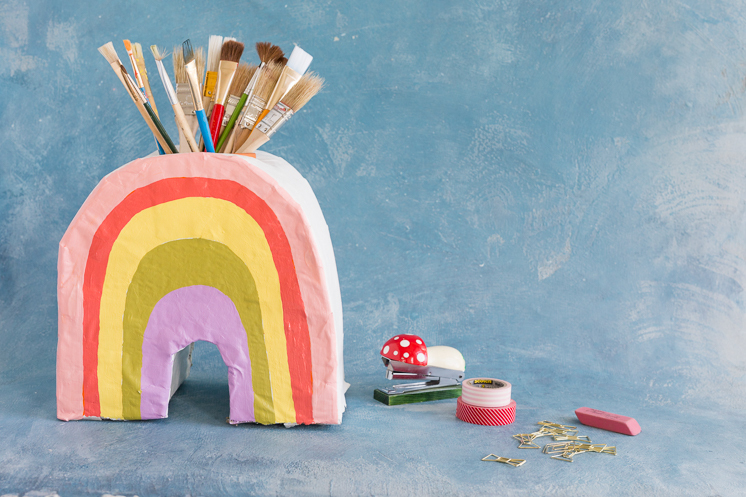 Being the paper lovers that we are, we had to try out a paper version so we could get our rainbow fix on this month. We love using ours as a pencil holder. You could also use this for a flower vase as well! We thought it would look adorable with some four-leaf clovers overflowing out of it! Or some lush pink peonies in the next few months. Paint in white, peach, pink, yellow, green, and purple. On cardboard draw a rainbow arch. Ours is about 9″ X 9″. Cut out the arch with scissors or an Exacto knife. Trace the arch on another piece of cardboard so you have two arches. Cut two strips of cardboard, one to cover the top of the rainbow and one to cover the small inner arch of the rainbow. Ours is 5.5″ wide, but you can choose your desired width for the vase. Trace the widest part of your terracotta pot on the top of the rainbow arch and cut out, so there is a hole at the top. Use tape to attach the strips to the arches. *This technique is also used for pinatas. For the paper mache mixture, combine 1 part flour with 1 part water in a bucket and mix well. Tear up your newspaper into small pieces. 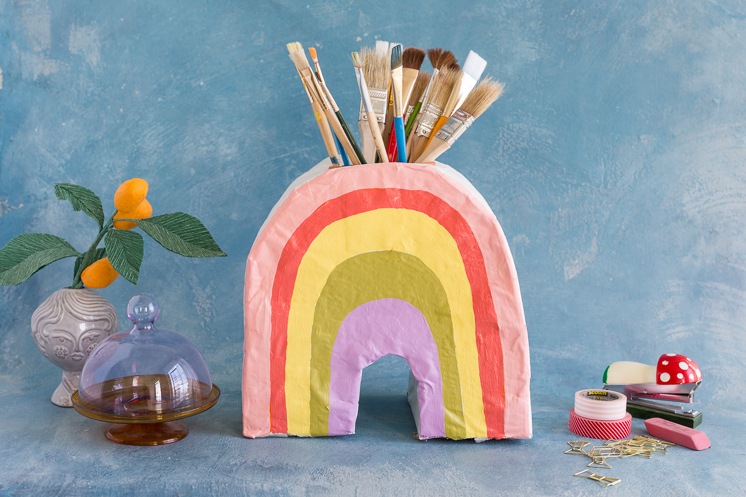 Dip the newspaper pieces into the paper mache mixture and smooth onto the cardboard rainbow. Cover completely, ensuring that the surface is smooth and even. Let dry. Paint a base coat of white, probably two coats. Let dry. 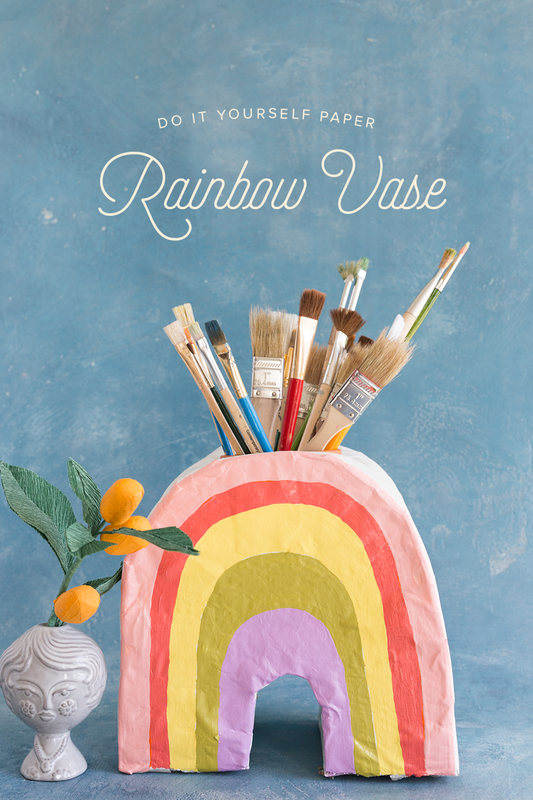 Paint on your rainbow to the front of the vase. Let dry. Place your pot into the hole at the top and fill with craft supplies!